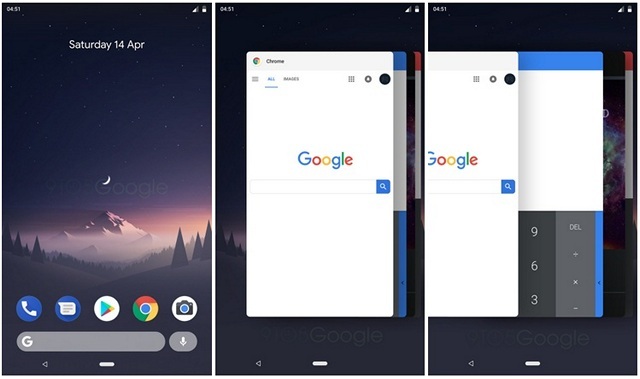 With Android P, Google is seemingly doing away with the standard Android navigation bar. With P, it will no longer be Back, Home and Recent Apps, but simply a pill-shaped home button, according to reports last week. Now 9to5Google has more on this scoop, revealing the functionality of the home button among other juicy details in a new post. Of course, the images below are just renders based on what someone who has used the new setup has described. The Recent Apps button is going to be retired with the ‘Home’ pill doing double duty. The pill can be tapped to go Home, or you can swipe up on it to open Recent apps. It’s not clear if double taps on this button switch between your last two open apps, as it does currently on Google’s Android experience on Pixel and Nexus phones. Recent Apps cards will be shown as a horizontally-scrolling list, with a swipe up closing open apps. The shift navigation is somewhat similar to iOS on iPhone X, but retains the Home button action for exiting apps, which is so intrinsic to Android users. The report also says long pressing the Home pill (bar?) will summon Google Assistant as usual. As for the back button, it’s said to disappear and appear based on the context. So it won’t show up when there’s no use for it, like on the Homescreen. We will know more about these changes in the coming days and are likely to get out first official look of it at Google I/O 2018, which promises to bring a lot of things to look forward to if you love Android.